Rev. Darrion Fletcher, 1963-2017, !Presente! (APN) ATLANTA — Rev. Darrion Fletcher, 54, an activist and spiritual counselor whose work focused on lifting up low-income people in some of Atlanta’s most distressed communities, Vine City and English Avenue, passed away on September 25, 2017. Fletcher had qualified to run against Atlanta City Councilman Ivory Lee Young (District 3) for at least the second time. Mr. Young, who had been criticized by Fletcher on many occasions, honored Fletcher with remarks at the beginning of the Full Council Meeting on October 02. Atlanta Progressive News interviewed Fletcher in 2013 regarding his campaign for the District 3 Council seat. He was educated in the Atlanta Public School system and graduated from J.E. Brown High School in 1981. He received his Associate degree from the now-defunct Massey Business College, and a Divinity degree from Carver College. Fletcher founded Walking Through the Vine as an outreach ministry, or a ministry without a physical building, and Fletcher considered himself a community pastor. Fletcher has received several awards and proclamations over the years, including a Proclamation and Phoenix Award from Mayor Kasim Reed; an Outstanding Georgia Citizen Award from the Georgia Secretary of State; a Community Service Award from State Rep. “Able” Mable Thomas; and others. “He was a courageous leader, which is, he worked to make a difference. And he did,” State Rep. Thomas told Atlanta Progressive News. “He was the person to create the first youth health fair focusing on healthy foods and healthy living for young people,” Thomas said. “People would come together around food. I don’t know how he came up with the idea. That’s sort of unique, this one was specifically for kids. There were counselors there, you could check your blood pressure. There were youth activities,” Thomas said. “If we were in a meeting with Fletcher, if he didn’t thought people weren’t being taken care of, he would keep standing up until people understand,” Thomas said, referring to Neighborhood Planning Unit and neighborhood association meetings. “He didn’t allow downtown to run over adults either,” Thomas said. “He was a funny guy, he could crack jokes with you,” Thomas said. “He always carried gospel music at all his events,” Thomas said. “The other thing he was good at, in workforce development, he took the charge to make sure kids had summer jobs. He would go right down to Workforce Development [AWDA] and say, ‘We need to get these children work.’ How you gonna tell him no?” Thomas said. “He was responsible for some of the kids that was college bound. There was a program, if you were from Atlanta you could get funding to go to college. He was able to get – I know at least three people going to college because he went down to Workforce Development,” Thomas said. In 2013, Fletcher told APN that Walking Through the Vine puts on numerous programs for Vine City and English Avenue neighborhoods each year. These events include a Youth Day, a Family and Friends Day, and Meet and Greet Neighbor Day, a crime prevention event, and a Tree Light Up. At the Tree Light Up, the ministry has routinely fed over a thousand people a soul food dinner each year for several years. The ministry also has provided toys for the children at the event, and the event has featured gospel performers. “Rev. Fletcher was a true Public Servant,” City of Atlanta Commissioner of Constituent Services Andrea Boone told APN. “He was always concerned about the kids and young people and was selfless, never asking for help for himself,” Boone said. “He was a giant and an unsung hero. I am proud to have called him friend,” Boone said. “Rev. 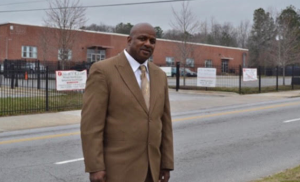 Fletcher, simply stated, was a good shepherd of his flock, and his flock went far beyond the boundaries of Vine City,” Councilman Young told APN. “He planted himself wherever the needs existed to serve the needs of constituents on the Westside,” Young said. “And he could speak to our community in ways that everyone understood,” Young said. Fletcher was a sharp critic of Mr. Young. “He and I often shared opinions and even though we found ourselves communicating in different ways to different constituencies, he frequently never hesitated to share concerns with me about things that he did not agree with,” Young said. “I consider him a friend, because friends tell you the truth. My filter was always on so that when we talked about the good or the bad, I was able to hear him. Hearing him made me a better person,” Young said. “He was a man that had no fear. The streets on the Westside, belonged to him, no matter what nook, what corner it was, there wasn’t a corner that he didn’t feel comfortable,” Young said. “That meant that we had eyes and ears in every part of the Westside, at a moment’s notice, if he saw something that wasn’t quite right, he never hesitated to communicate it to us, and we could immediately respond and deploy resources… he was the kind of watchdog to make sure that it happened,” Young said. “We elected officials can’t be every place, we rely on an active constituency. Rev. Fletcher was always engaged… I love the brother,” Young said. Fletcher is survived by his wife, Jacquenette Fletcher; his four sons, Marquez, Darrion, Lamar, and Marcus; four daughters, Schenna Fletcher, Kerlida Marceo, Sabrina Timothy, and Shanterria Quantavus; and siblings Twallace Fletcher, Della Irvin, Latausher Fletcher, Jamvetts Vergil, Shelia Timothy, Marcus Fletcher, Candace Fletcher, and Shakeria Fletcher. A candlelight vigil honoring Mr. Fletcher was held at Vine City Park on yesterday evening, Saturday, October 07.